COMMENTARY ON "Matthew 24 and 25"
There are important warnings and lessons Jesus gives us concerning the end times in the parables we will be examining however in Christ Jesus there is no fear. When we study the parables Jesus gives us in Matthew chapters 24 and 25 it is important to learn, remember and understand that those who have accepted in faith Jesus' covering shed blood for the full atonement of their sins can never be separated from the love of God. 1. The unbiblical book and Great Controversy doctrine as taught from within Adventism is false and heresy because it limits the sovereignty of God. When considering the warning given in this memory text it is critical to know that the author and promoter of the Great Controversy doctrine is a false prophet. Therefore the commentary for this week will ignore the Ellen G. White quotes. 3. Jesus Christ fulfilled perfectly and completely the conditional requirements (laws) of the Old Covenant and thereby replaced the Old Covenant with a New Covenant. The "law of the Spirit" is not the "law of sin and death". Those who endure to the end will be saved. So, who is it that will endure? Romans 8:31-39 gives Christians the assurance that those who have been transferred into the kingdom of God can never be separated from the love of God because our salvation is founded solely upon who our all knowing all powerful sovereign God is instead of the our own fallible strength or works. According to Scripture what is the "gospel of the kingdom"? The gospel that will "make disciples of all nations", the one and only gospel that brings a sinner into the kingdom of God is that Jesus died for the sins of the world at Calvary as the perfect Lamb of God, descended into the grave and then arose three days later in triumph over death. Those who accept Jesus as their Savior in faith receive the promised indwelling Holy Spirit which brings their spirit to life, Gal. 1:9, Gal. 3:14 & 1 Cor. 15:1-5. Scripture assures us that Jesus will always be with us, meaning the saints of God will never face the 'end time events' without his promised indwelling of the Holy Spirit. It is another lie of Adventism to teach that the saints of God will ever be forced to stand alone in the face of evil because we can never be separated from the indwelling Holy Spirit, Rom. 8. Even though the right health practices may be good for our physical bodies, attaching such a message to the gospel of Jesus Christ produces a false gospel which denies the completed atonement of Jesus' shed blood at Calvary for the sins of the world. • Those sinners who have accepted in faith Jesus' covering shed blood have been transferred eternally into the kingdom of God and have God's promise that they will never be separated from the love of God. Therefore they have the assurance that they will endure to the end. • The coming "Abomination of Desolation", terrible as it will be, is an exciting sign that the end of this age with all the evil that it contains is coming to an end because of Jesus' soon return. • The "gospel of the kingdom" that we are commanded to preach to all the world is simply and only centered on Jesus' blood he shed at Calvary for the full atonement of the sins of the world. • In this parable of the ten virgins, those who are awaiting the coming of the groom are not identified as the bride. Since the oil for their lamps represents the Holy Spirit, those virgins who have enough oil for their lamps do have the indwelling Holy Spirit. • Those who do not have enough oil for their lamps go to the source for that oil meaning they must accept in faith the shed blood of Jesus' atonement to receive the indwelling Holy Spirit before the groom arrives. That is, before the return of the Messiah Jesus Christ. • Since the context of this parable is a Hebrew Wedding and was first giving to Jesus' Jewish apostles it becomes clear that the five virgins who are included in the wedding party are Jews that have accepted Jesus as their long awaited Groom. Although it doesn't fully fit the pattern of a traditional Jewish wedding, the five virgins with enough oil in their lamps are also members of The Bride of Christ. • The Master (Jesus) is "going on a journey" but will return. While away he entrusts his servants with a certain amount of "talents". • Keeping in mind The Great Commission (Matt. 28:16-20) what Jesus is saying is that his true servants will be preaching the biblical gospel message of Jesus Christ (1 Cor. 15:1-5) and nothing that isn't the gospel (Gal. 1:9), thereby bringing in an increase to the kingdom of God while the master is away. While he is away his true servants will be indwelt and empowered by the Holy Spirit who will never leave them, Rom. 8:33-39. • The true servants bring in a great increase and are blessed by the master. • The false servant hides the "talent" given him and has nothing good to report. This "wicked and slothful servant" is cast into "the outer darkness". Since this parable was given by Jesus from within a Jewish context, this appears to apply to those Hebrew people who have not accepted Jesus as their promised Messiah. They have the "talent" but are not using it. • A true servant is one who has responded in faith to the biblical gospel and therefore knows and preaches nothing but the gospel of Jesus' shed blood for the sins of the world. The lessons for this week ignores the final discourse Jesus is giving the disciples concerning the end times. • Jesus has returned, is sitting upon his throne where upon he judges the nations and separates the "goats from the sheep". There is no so-called investigative judgment here. Eph. 1:4 declares God knew who would be "holy and blameless in his sight...before the creation of the world". • The "sheep" inherit the kingdom prepared for them "from the foundation of the world". In-other-words, God's plan for fallen mankind was in place before Adam sinned. • Jesus describes the acts of those who are righteous in verses 35-40 and ends by saying; "...as you did it to one of the least of these my brothers, you did it to me". We need to remember that this is what the righteous do, but is not how they are declared righteous. Only as we accept in faith the blood Jesus shed at Calvary are we righteous in the sight of God. • The "sheep" have displayed the two greatest commands of Jesus (to love God as he loves us and to love all others in this fallen world as God loves us) through their deeds. This display of love follows upon having been given, as an unearned gift, eternal life. • The "goats" depart into the eternal fire prepared for the devil and his evil angels. "Eternal fire" means eternal and has no ending otherwise "eternal life" wouldn't be what God promises it to be. 1. The sign and seal of the Christian faith is Jesus' promised indwelling of the Holy Spirit, John 6:27, John 14:15-17, 1 Cor. 5:5 & Eph. 4:30. 2. It is a foundational lie of Ellen G. White that Christians must 'stand alone' without the indwelling Holy Spirit during the "end times" because Scripture teaches that God's elect can never be separated from the love of God. 3. The saints of God in all ages have been (and are now being) persecuted for their faith in God as stressed in Hebrews chapter eleven. 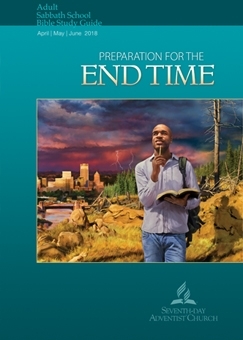 Therefore persecution, as such, is not unique to the end times that immediately precede the return of our Lord and Savior Jesus Christ. The warnings of Scripture concerning the increasing madness of our times that now seem to be upon us should assure Christians that God knew all of this before time began. Instead of fear we should anticipate with joy the soon return of our loving righteous Savior Jesus Christ who will bring all things evil to an eternal end. 4. For now we should keep in mind that the two greatest commands for the saints of God are to love God as he loves us and to love all others in this 'life of the flesh' in the same way God loves us. This godly love is to be displayed by our actions. When you 'see someone hungry or thirsty or a stranger or naked or sick or in prison', out of godly love you respond to their needs. 5. The greatest need of all sinners is to meet the Savior Jesus Christ. The command to "make disciples of all nations" means to preach the biblical gospel of Jesus Christ's perfect sinless shed blood for the full atonement of the sins of the world. 6. Those who have in the "faith of Abraham" accepted Jesus as their Savior and Lord are already ready for the return of Jesus at the end of this age. All saints of God, in all ages, have the very same promise Jesus gave to the thief on the cross even as we may have either died in Christ or are alive at his soon return. "Antiochus IV Epiphanes: Is He the Little Horn? "The Covenants: The Continental Divide of Biblical Interpretation"
Copyright 2018 BibleStudiesForAdventists.com. All rights reserved. Revised May 2, 2018. This website is published by Life Assurance Ministries, Camp Verde, Arizona, USA, the publisher of Proclamation! Magazine. Contact email: BibleStudiesForAdventists@gmail.com.